It may be difficult for a contemporary westerner approaching mid-20th century Congolese rumba for the first time to have any real understanding of how this music sent rhythmic shock waves up and down the African continent in the 1950s and 60s. It might take a few spins to recognize that the grooves held so firmly in check under what seem like such polite, non-threatening vocal harmonies are no less radical for their rigidity. And of course electric guitar bands such as Kabasele's, as well as OK Jazz, African Fiesta and others ran elegant, fluid, shimmering circles around anyone in American pop music of the same era. Perhaps frustratingly, this music is one of the few things taken from the Congo that hasn't led to environmental and social catastrophe, civil war or megalomaniacal dictatorships. Somehow, in the years leading up to the country's 1960 independence, and the absolute failure of that moment, this sensual, harmonious, dance band music managed to contain all the hopes that nothing else this resource-rich hunk of Central Africa seemed able to hold onto. 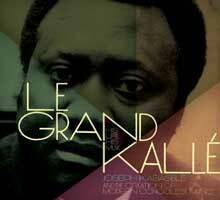 It was also a product of a burgeoning pre-independence Congolese middle class, and at the music's forefront was vocalist/bandleader/songwriter Joseph Kabasele, aka Le Grand Kallé. Kabasele's obsession with musical forms outside his Catholic household led him, as a teenager in the 1940s, to studios in what was then (before the ouster of the Belgians and a name change to Kinshasa) Leopoldville. Thanks to that city's reasonably close proximity to the Atlantic, imported records, especially those made by Afro-Cuban sextets, complete with African-derived clave rhythms, filled Kabasele's ears. And it was this influence that went on to permeate so much of Congolese pop music, and much of Africa, for decades to come. Kabasele's voice, as well as his skill for penning songs, earned him his own name and photo on 78s released in the early 1950s; so it was only a matter of time before he attracted musicians whose names still loom large in African pop music history. Tabu Rey Rochereau, Manu Dibango, and guitar maestro Nicolas Kasanda (Nico) were all members of Kabasele's African Jazz Orchestre at one time or another. And for the better part of two decades, they cranked out hundreds of sides, traveled the world, and spread rhumba around Africa in much the same way Elvis Presley infected mid-fifties working class North American teenagers with the itch to jack a seemingly speed-induced R&B frenzy into what had been known as hillbilly music. This collection splits the recordings into those Kabasele made pre-independence with the always evolving version of his original band between 1951 and '62, while disc two houses cuts done with a completely made-over version of the band (it seems Kabasele was not known for paying band members) between 1964 and 1970. And it is undeniably the first disc, featuring tunes showing the style in its infancy and rawness, which is closer to essential. Of course, “Independence Cha Cha” is included here, rush-cut when the early hope of Patrice Lumumba, a friend and fan of Kabasele, was still in the air. There is also the 5-minute single version of “African Jazz Mokili Mobimbo,” the band's spirited announcement that the entire world wants to hear the music of Africa. But elsewhere, we hear the first doses of Nico, and with it, the beginnings of Congolese electric guitar, a style still unmatched in its equal measure of subtlety and body-moving intensity. By disc two, the songs stretch on slightly longer, but the rawness is largely gone, and it's likely that, by the end of the 1960's, Kasabele's music seemed trite.